While leafing through a magazine at her doctor’s office, Barbara Brown came across an article about Dr. Sarah Friebert, who was being recognized as one of the area’s top doctors. “Learning about the work of Dr. Friebert and the palliative care team really resonated with me,” Barbara said. Later that evening, she told her husband what she had read and how the Haslinger Family Pediatric Palliative Care Center helps families on their journey of care. He encouraged her to contact Dr. Friebert to see how she could help. “I looked her up and left a voicemail message explaining that while this was probably an unusual call, I was moved by her work and wanted to see if there was some way I could help,” Barbara said. Dr. Friebert called her back and asked if she would like to learn more about the Haslinger Center. Barbara later joined the Community Leadership Team, a group of volunteers who serve as advocates for the center and help advance its mission. Barbara has served on the Community Leadership Team for the last 7 years, currently serving a 2-year term as chair. One of her first tasks was making weekly check-in calls to families. 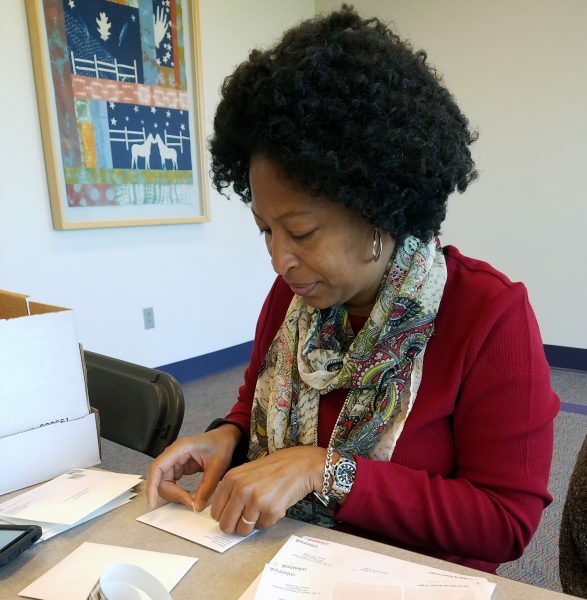 “I was a little overwhelmed since I don’t have a medical background, but I soon found it very rewarding to connect with the families and see how they’re doing or if there’s anything they need,” Barbara said. It has also brought her great joy to assist with the Holiday Elves program that delivers gifts and other holiday treats to palliative care families. She enlisted her sorority sisters to help fill stockings. “It’s wonderful to see how the families appreciate the help and how something so simple can make someone’s day,” she said. As chair of the Community Leadership Team, Barbara leads the group in supporting the care delivered by the palliative care staff. This includes day-to-day needs such as the card ministry that provides handmade cards to acknowledge special days for bereaved families, as well as new initiatives like Hillary’s Cherished Gowns, which provides bereavement gowns for premature babies, and a global partnership with Happy Feet Home, a pediatric hospice facility in India. Always a champion for the center, Barbara is currently trying to recruit a friend who’s an attorney to provide some needed services for the families. She continues to spread the word about the center throughout the community. In some ways, her involvement with Akron Children’s has come full circle. She is now working at the hospital as a human resources business partner, serving as a liaison between HR and 3 different hospital divisions. Perhaps it’s this strategic perspective that helps Barbara see the big picture when it comes to palliative care. Barbara and her husband Charles live in Akron and have a 23-year-old son, Caleb. A bit of a foodie, she enjoys cooking and trying new restaurants.